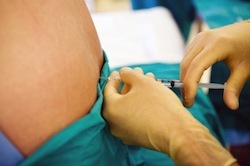 There are various options for pain control during cesarean section delivery. Regional pain blocks, like the spinal, are increasing in popularity, but there are multiple drugs to choose from. Researchers from the Anesthesiology and Reanimation Clinic in Istanbul recently tested levobupivacaine and fentanyl against bupivacaine and fentanyl. Fifty women scheduled for a C-section were given either 15 mcg fentanyl and 7.5 mg levobupivacaine or 15 mcg fentanyl and 7.5 mg of bupivacaine via spinal injection. Mean time for sensory and total block were shorter in the bupivacaine and fentanyl group, but levobupivacaine and fentanyl lasted an average of 16 minutes longer. Conclusion: Both bupivacaine and levobupivacaine work well with fentanyl for sensory and total block. Bupivacaine takes less time to work, but levobupivacaine works longer. Levobupivacaine, though a novel drug, may be a viable alternative to bupivacaine. Source: Turkmen A, Moralar DG, Ali A, Altan A. Comparison of the anesthetic effects of intrathecal levobupivacaine + fentanyl and bupivacaine + fentanyl during caesarean section. Middle East J Anesthesiol. 2012 Feb;21(4):577-82.